ABS-CBN Lingkod Kapamilya Foundation, Inc. - Bantay Kalikasan (ALKFI-BK) conducted “Earth Warrior” recollection in Dao Balay Kawilan, Dulag, Leyte. The purpose of this activity is to empower community members and to instil the values of integrity, responsibility, accountability, service with excellence, sharing of talents and resources for the service to others. Forty – five (45) representatives from various BK – assisted projects in the Provinces of Leyte and Samar attended this one-day activity. Participants include community members from Sabang Daguitan Surf Camp, San Jose Skimboarding Camp, San Jose Farm, San Juan by the Bay Project and Sohoton Caves and Natural Bridge Project. 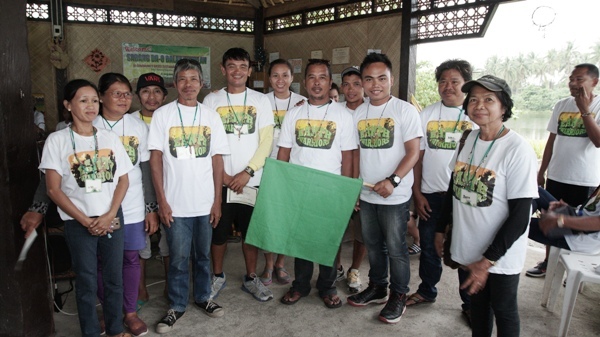 As an environmental arm of ALKFI, old and new staff of Bantay Kalikasan also attended the recollection for the staff to be more effective and efficient in their responsibility of not only providing technical support to these projects but also to be one with the communities in protecting and sustaining their natural environment. One of the highlights of the training was the spiritual talk given by Fr. Ramil Costib from the Parish of Our Lady of Fatima. Fr. Costib emphasized the need for community members to look back on their sacrifices and value the hardships they have been through after Typhoon Yolanda. He asserted that it’s time to renew commitment to better serve others. He also shared that it is greatly fulfilling if someone achieved all of his life’s dreams if it involves hard work, sacrifice and faith in God. The activity also included group games, team activities and activity reflections which highlighted better communication, coordination, teamwork and camaraderie among members of the organizations. In closing, the participants who were mostly affected by super typhoon Yolanda have come to appreciate more the significant impact and meaning of ALKFI’s programs and projects in transforming their lives and in molding their communities despite challenges. This is not simply measured by financial gains but also on how members of the organization work as a team and eventually use their resources to touch the lives of their fellow.